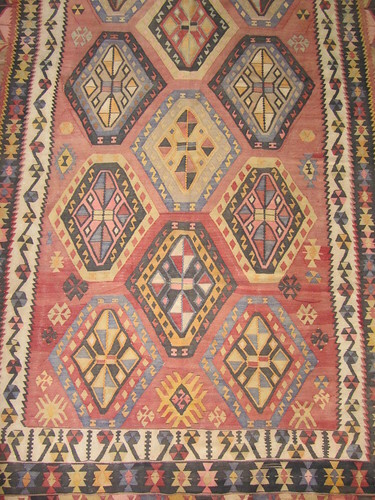 Kilim is the Turkish word for a flatweave or pileless rug. Based on many relics of the past, we believe that the weaving-technique of kilims goes back for thousands of years. Untill very recently, they weren’t produced for commerce, but played a central role in family life as part of a dowry. Westerners have only recently discovered this type of weaving even though some kilim lovers had already been appreciating its incredible art form for quite some time. The techniques of spinning of the wool, dying of the colours and the weaving in itself have all remained the same over the years. These traditional techniques continued until the end of the 19th century when chemical dyes appeared. Each tribe, each village has its own style, inherited from previous generations : bright or dark colours, complex or simple patterns, varying from region to region. Yet, there is much individual freedom in each woven kilim. Each kilim is a truly unique piece, inspired, authentic, modern through its graphic patterns and eternal through its ancient sources of inspiration. The collection of TRŌVE consists of kilim rugs in different colours, patterns and sizes, hand picked from all over Turkey. To help you find yours, we've organized the kilims by their main colour. Please have a look around and don't hesitate to contact us for assistance.